^ Greenwood, Colin. Mark Linkous RIP. Radiohead. 2010-03-08 [2010-03-10]. （原始内容存档于2010-03-09）. ^ 2.0 2.1 Ross, Alex. The Searchers: Radiohead's unquiet revolution. The New Yorker. 2001-08-21 [2007-06-14]. （原始内容存档于2007-05-25）. ^ 3.0 3.1 Eshun, Kodwo. The A-Z on Radiohead: An interview with Colin Greenwood. Culture Lab UK. 2001-06-21 [2007-06-14]. ^ 4.0 4.1 Davis, Jason. 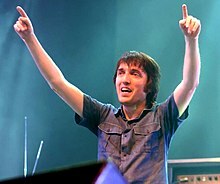 Interview with Colin Greenwood. Channel V, Australia. 1998-02-01 [2007-06-17]. ^ Radiohead. UNCUT Magazine. 2001-08-01. ^ Hendrickson, Matt. Dream Weavers. Rolling Stone. 1997-10-16 [2007-06-17]. ^ 7.0 7.1 Kelly, John. Taking Music To Strange Places. The Irish Times. 2001-09-15 [2007-06-16]. ^ Myers, Caren. Dork Radio. Details. 1993-11-01 [2007-06-16]. ^ 9.0 9.1 Clark, Stewart. Transistor Act. Hot Press. 1995-07-12 [2007-06-16]. ^ Kent, Nick. Happy Now?. MOJO. 2001-06-01 [2007-03-26]. （原始内容存档于2012-02-06）. ^ Radiohead, Foals and 25 years of discovering Oxford music - BBC News. BBC News. [2016-03-14] （英国英语）. ^ Ross, Alex. The Searchers. The New Yorker. 2001-08-20 [2011-03-16]. （原始内容存档于2008-02-14）. ^ Greene, Andy; Greene, Andy. Radiohead, Janet Jackson, Stevie Nicks Lead Rock and Roll Hall of Fame 2019 Class. Rolling Stone. 2018-12-13 [2018-12-13] （美国英语）. ^ Clements, Peter. Plank's Blog – full archive. StringsReunited – getting your sound back. 2007-06-07 [2007-06-16]. ^ Annual Report: All Access. University of Cambridge Annual Report. 1997-08-21 [2007-06-14]. （原始内容存档于2007-03-17）. ^ Smith, David. Today, Truth!. Preoccupations. 2006-11-08 [2007-06-16]. （原始内容存档于2007-09-28）. ^ Radiohead’s Colin Greenwood Reviews New Michael Palin Book | Pitchfork. pitchfork.com. [2018-09-30] （英语）. ^ Is Tamino the heir to Jeff Buckley?. The Independent. [2018-12-02] （英国英语）. ^ 22.0 22.1 Kim, Wook. School of Rock: 10 Supersmart Musicians. Time. [2018-08-08]. ISSN 0040-781X （美国英语）. ^ Class Notes 2000. Skidmore Scope Magazine. 2000-08-01 [2007-06-16]. ^ Klosterman, Chuck. Fitter Happier: Radiohead Return. Spin. 2003-06-01 [2007-06-17]. ^ Greenwood, Colin. Operatic. Thrasher Magazine. 2005-04-01 [2007-06-17]. （原始内容存档于2007-10-12）. ^ Giving Back From The Bassline. Mail & Guardian. 2013-02-01 [2013-02-01]. ^ Photography collection at the V&A redisplayed and online. Cognitive Applications News. 2003-05-01 [2007-06-15]. （原始内容存档于2007-07-06）.